And appeared white as snow Victorious one. 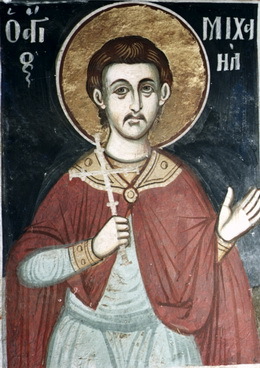 The Holy New Martyr Michael was born in Vourla of Asia Minor. He was a coppersmith by trade, very youthful (about 18 years of age), and of a goodly appearance. He was, however, once deceived by a certain Turkish coppersmith, his employer, and denied the faith of Christ. His renunciation took place on the first Saturday of the Great Fast. At length, when Pascha arrived, Michael heard in a coffeehouse his peers and all the Christians celebrating the light-bearing day and chanting with exhilaration and joy that beloved hymn, "Christ is risen...." Deeply moved in his heart, he realized the evil that he had committed. He repented within himself for his reckless folly. Then he abandoned the task he was engaged in and chanted with the others, "Christ is risen...."
But when those present heard him, they hindered him and said, "It is not fitting for a Muslim to utter words that are proper only to Christians." Then Michael answered, "Tomorrow you shall see who I become." In the morning of the following day, he went to the judge and said to him, "If one was deceived and gave out gold and received lead, is it lawful for him to return the lead and take back his gold, as the exchange was not fair and it was done unknowingly and with deception?" The judge responded, "Yes." Then the martyr of Christ continued, "Then take the lead which you gave me, namely your own religion, and I will take back the gold I gave you - the holy faith of my parents." With such forthrightness did Michael confess Christ, the omnipotent God, before the Muslim judge and all those who sat around him. Since they all wondered at his courage, they began to answer him with flattery and promises of precious gifts. Moreover, they reproached every Christian ideal and praised Muhammad as the great prophet. But when they saw that the martyr was firm in the Orthodox faith, they cast him in jail until a second inquiry. Two days later, the Saint appeared before the judge again. After Michael confessed Christ as the true God, he was condemned to death. As the blessed one was led to execution, he appeared joyful and glad. He also asked forgiveness from the Christians who had gathered there. Then he bowed his head and was executed by the sword, receiving from Christ the unfading crown of martyrdom. Saint Michael's honorable relics were left lying for three days. During that time they appeared white as snow. Afterward, they were cast into the sea and washed ashore near a location called Phoenicia. A group of Christians who were present, saw the holy relics with the honorable head. They gathered up the relics with devotion and brought them to the Church of Saint Photini [in Smyrna], where they were buried with honor. By the intercessions of this holy Martyr Michael, may we be deemed worthy of the kingdom of the heavens! Amen.